Grant Achatz lectures about his cooking techniques. Frozen and chewy. Hot and cold. Chef Grant Achatz is a master of surprise when it comes to the juxtaposition of unexpected flavors, textures and scents. 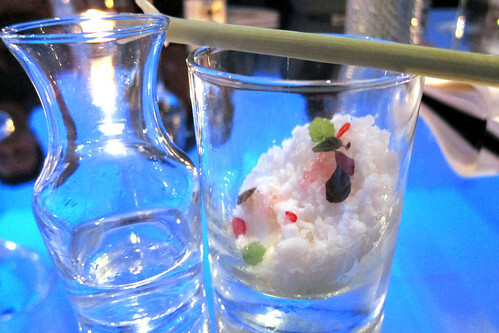 At his acclaimed Chicago restaurant Alinea, it's nearly always omakase, a baroque tasting menu designed to startle the palate and please it in unusual ways. Or so I've heard. 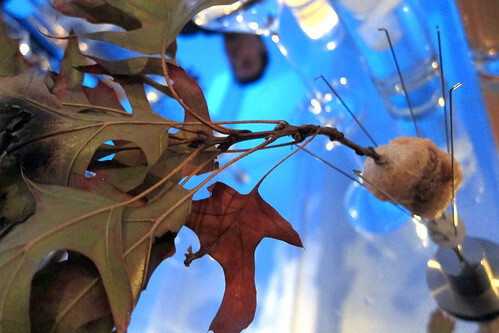 For one night, Achatz packed Alinea, and moved it 1,700 miles west, to cook at a private event in Los Angeles. 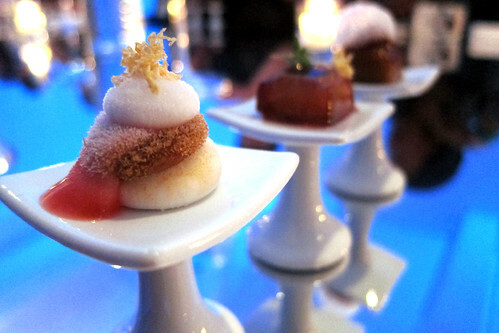 It featured edible cocktails, smoking oak leaves and a massive shared dessert that ran the entire length of the 50-person table. The "sensory analysis workshop," designed mainly for bartenders, began with a blind nosing of six liquors followed by a vodka tasting and a discussion of how we understand and explain our sensory experiences. Think, for a moment, about the "language of taste." 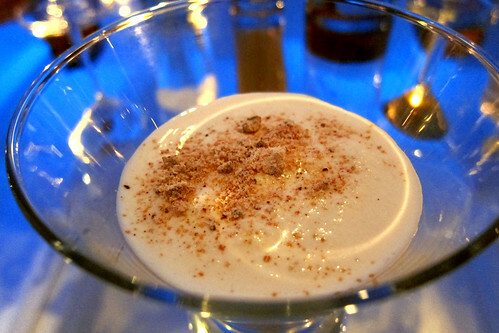 How do you describe the flavor of milk -- without mentioning milk? Then came a lecture by Achatz, a shortened version of the talk he gave at Harvard about a month ago, along with slides and videos. We learned about flavor-bouncing, the brainstorming technique Achatz uses to combine what seem like unlikely flavors into a harmonious dish. 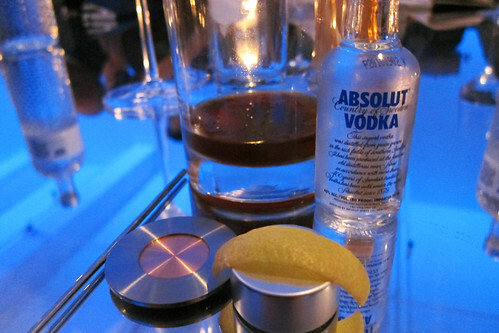 All of this led to the main event: a nine-course dinner with accompanying Absolut vodka cocktails for each course. 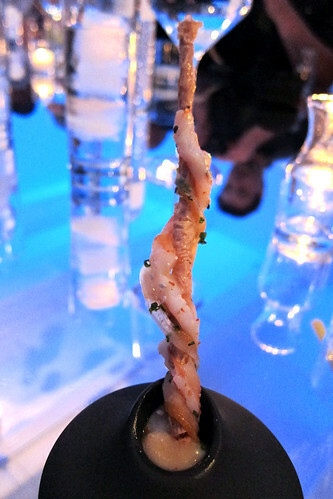 I don't habitually write about press events, but when it's a dinner cooked by Grant Achatz, I make an exception. Front: Luxardo Amaro, Luxardo Bitter, frozen and chewy. Middle: Laird's Apple Brandy, Grenadine, thyme. Back: Cynar, Carpano Antica, Flor de Cana 7-year. Golden trout roe from Michigan, coconut mousse, pineapple foam, basil freeze-dried coconut and pineapple, black licorice gel. 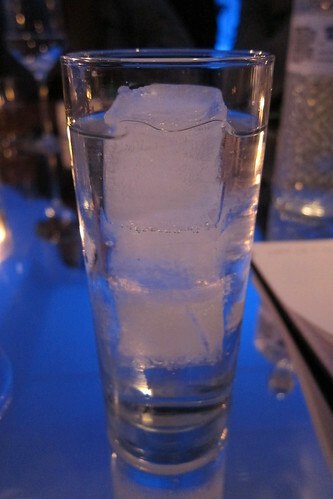 Absolut Vodka, distilled pineapple soda with flavored ice cubes and a drop of Pernod on top. Yuba (dried bean curd skin) that's boiled then fried with shrimp wrapped around it, togorashi, pickled onion, orange taffy and miso mayonnaise. That's a lemongrass swizzle stick. You add Absolut Peppar, use the lemongrass stalk to muddle it and it becomes a gingery Moscow Mule. Chestnuts, lentils, lobsters, parsnips, turnips, either apples or quinces with balsamic, maitake mushrooms, cider nage and rosemary vapor. The bowl that the stew sits in is filled with fresh rosemary branches. 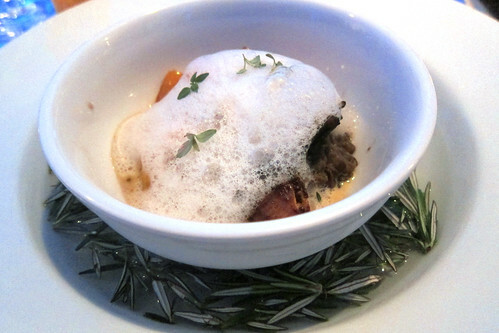 When the dish arrives at your table, a waiter pours hot water into the outer dish, releasing the fragrance of rosemary. 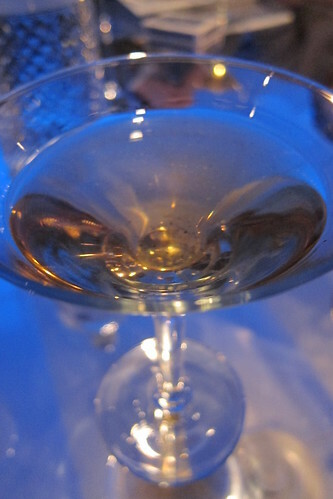 Absolut Kurant, Absolut Citron, Pommeau de Normandie, champagne and apple spheres served with a glass straw. It's like alcoholic boba. Pheasant, peeled green grape, candied walnut with oak leaves that have been lit on fire and arrive at your table still smoking, to evoke the scent of autumn. Absolut Vodka, Pernod and lemon peel. I think of this as deconstructed Peychaud's bitters. Wagyu short ribs cooked sous vide served with caramelized broccoli, broccoli stems, mustard seeds, peanuts and a thin film of Guinness gelee. Barrel-aged Absolut 100, Noilly Pratt, house orange bitters. 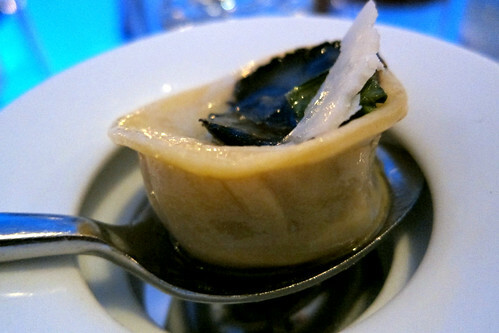 A very fancy version of xiao long bao (Taiwanese soup dumplings), this is filled with an incredibly rich truffle broth and topped with romaine and a shaving of parmesan cheese. 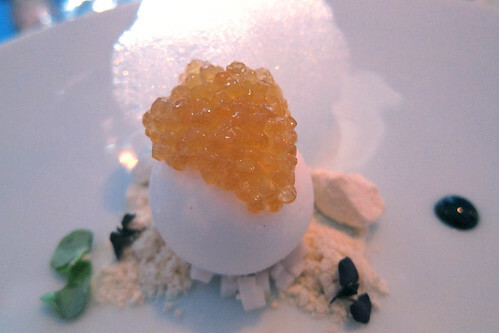 Achatz says this is the dish that got him the job at Alinea. I can see why. Absolut Pear, Yellow Chartreuse, Poire Williams, Creme de Cassis. This drink was simultaneously hot & cold. 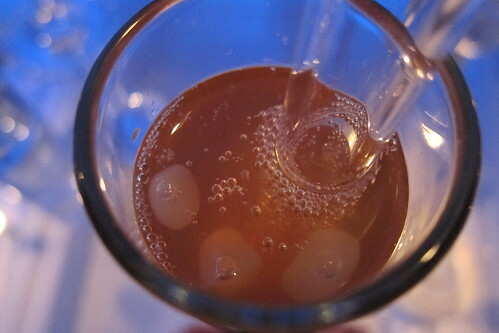 Achatz recommended that we drink it in one continuous draw, without stopping to put it down. 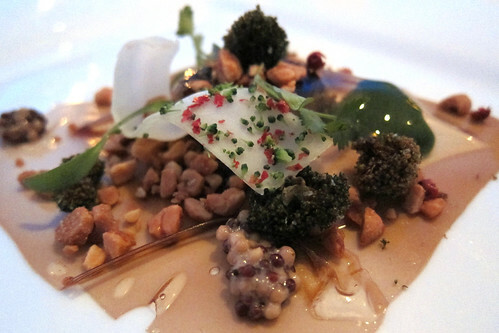 "We go through a lot of truffles," Achatz says. I bet he does. That's powdered Nutella on top. 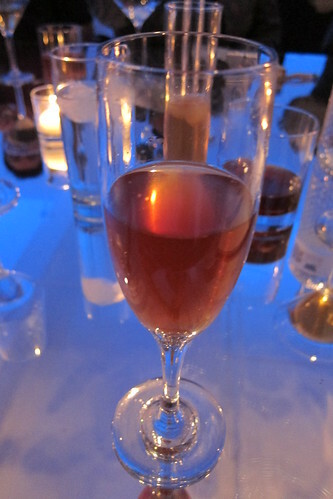 Absolut Vanilla, Averna, Amaro Abano, coffee aroma. 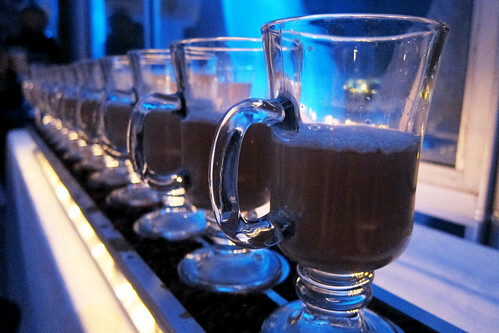 Like a fancy (and much better tasting) Irish Coffee.